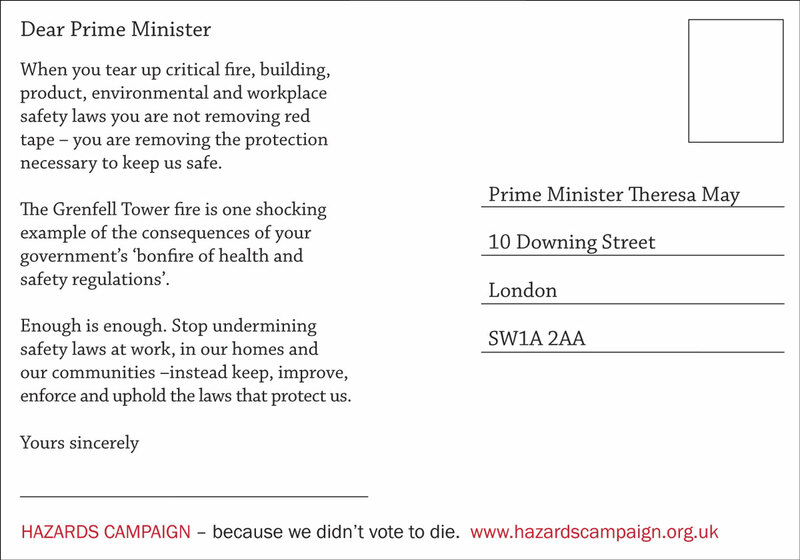 The Hazards Campaign tells the government to get on with it! The comment follows the publication of a DWP report on construction fatalities and a follow up report by the government’s Work and Pensions Committee. This has been backed by the Work and Pensions Committee who said: “The Committee has endorsed the recommendation for positive duties on directors in Rita Donaghy’s recent report. “ The committee also gives support to the DWP’s construction report. There are other areas where the two reports agree. Increasing worker involvement in health and safety issues, holding negligent employers to account and an end to blacklisting. The DWP report explicitly calls for more resources for the Health and Safety Executive (HSE) in construction and higher fines in the courts. The Hazards Campaign has been calling for these initiatives for very many years. Hazards Campaign says HSE’s ‘Be part of the solution’ is a damp squib and the state of H&S at work is much worse then they think! HSE’s strategy speaks of ‘The need for strong leadership’, but does not call for legal H&S duties on directors, just more exhortation to champion H&S and the current ineffective voluntary guidance. It speaks of ‘Involving the workforce’ but does not recommend new rights for safety reps or more enforcement of existing rights and the employers duties towards safety reps and workers generally, the effect of this is to undermine the practical mechanism of resolving problem at source and creating good H&S at workplace level. The strategy merely appeals to everyone to sign up to doing better but offers no more severe sanctions to employers and business if they carry on in the same abysmal way It does not make clear that in its current enfeebled state the HSE is not capable for delivering the drastic improvement that is essential as it needs more resources and political will to enable it to act as the effective enforcement agency we desperately need it to be to create a better H&S culture. The featuring of Corus on the promotional video as signing up to the strategy without any explanation that Corus has killed a large number of workers and therefore has very serious problems to address, undermines their case. The strategy states that most people underestimate the number of people killed and injured by work, but then underestimates the figures itself! It fails to mention the millions made ill and the tens of thousands dying of occupational illness every year (2) It does not make clear that the burden of this poor health and safety is mostly borne by workers and their families in heartbreak and distress, or that of the up to £30 billion per year cost to society the employers, who create the risks that cause this horrendous toll, pay less than 25% of this cost (3) We simply cannot afford employers lack of compliance and outright criminal negligence at the best of times, let alone in a recession which threatens to put more workers at even greater risk. The strategy does not refer to the damaging impact of deregulation and soft touch regulation on health and safety which when it was applied to the financial sector is almost universally blamed for causing the recession that now threatens workers lives even more. The HSE should reject deregulation and act as the workers’ H&S champion. 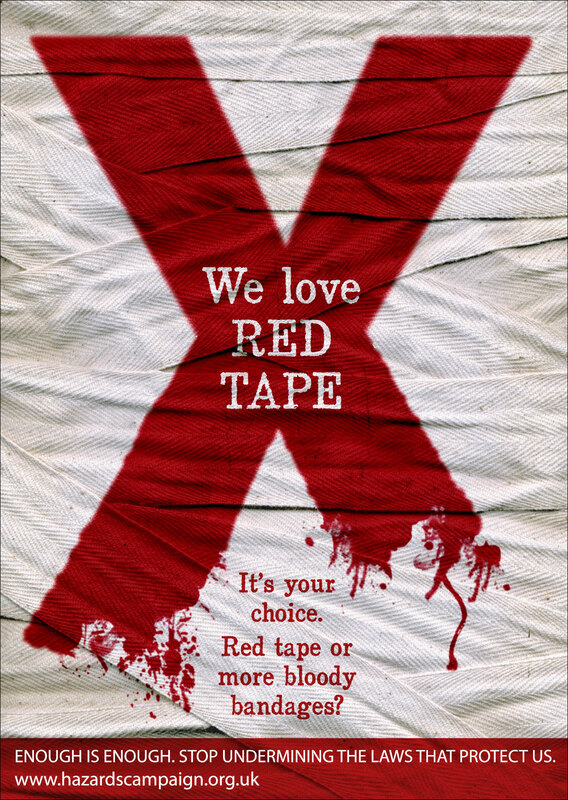 ’HSE’s ‘Be part of the solution’ fails to shows the leadership and intention to get tough on the employers who create the risks that make people sick, injure them and kill them that a real enforcement agency should exhibit. It is not what employers say that is important but what they do, and the majority are not consulting workers, not complying with basic risk prevention and are not fully accountable for their actions or omissions. Without a massive injection of resources and real political will to tackle the many noncompliant and criminally negligent employers, it is hard to see how more voluntarism can have any real impact. The HSE has already gone soft on enforcement and there is a massive lack of deterrence as inspections, investigations of injuries, enforcement notices and prosecutions are all down. Lack of enforcement of safety reps rights and of employers’ duties towards them undermines the massive and well accepted union safety effect in the workplace and is mere lip service to worker involvement. The Hazards Campaign, a coalition of union and health and safety campaign groups, has spelled out key issues to be raised in response to HSE’s strategy consultation. Real burden – Stop worrying about the health and safety “burden” on business; HSE must recognise the real burden is borne by those made ill, injured and killed and their families. True toll – When HSE talks about the harm caused by work, it should acknowledge the real toll – the tens of thousands killed by work cancers and occupational diseases every year, the hundreds dying on the roads while working and the thousands of other deaths not including in HSE fatality statistics. Credible threat -Existing enforcement practice is not good enough. There must be more HSE investigations, inspections and enforcement action. Regulation -HSE must reject explicitly any deregulatory rules or pressures that would affect its ability to do its job. Widespread problem -Safety law-breaking is not a minority matter – lots are at it but go unseen because of HSE’s failure to inspect. HSE must demand the resources to do its job right. Safety reps – Lip service to safety reps is not good enough. There must be vigorous enforcement of safety reps’ rights and involvement of safety reps by HSE. A high level safety reps’ rights champion must be appointed by HSE to ensure this is given a top priority. Roving reps – HSE must support roving safety reps to carry the union safety effect into small firms and throughout the supply chain, with special emphasis on high risk industries including construction and agriculture. than murders, and up to 50,000 due to occupational illness each year. Paul Kenny general secretary of the GMB will be opening this photographic exhibition on Monday 1st December at 5.30pm.The photos graphically illustrate the gruesome reality of the immense expansion of the asbestos hazard as it is experienced by workers and the public in the Indian subcontinent. Congress House, Great Russell Street, London WC1B 3LS. Please pass this information on to any contacts you have who may want to view or hire the exhibition. The London premier of this travelling collection supplements the September 2008 publication: India’s Asbestos Time Bomb.